The only character that utters anything approaching common sense in Little Fockers, – the tertiary installment in the Meet the… series – is Dr. Bob Banks (Tom McCarthy), appearing for the first time since Meet the Parents. In explaining his infidelity to wife Debbie, the daughter of curmudgeonly patriarch Jack Byrnes (Robert De Niro), Bob claims it was his only way out of Jack’s “circle of trust” and off the Jack Byrnes hamster wheel. If only the rest of us could buy a ticket on that ride. Like its older cast members, Little Fockers is past its prime and quickly runs out of steam. 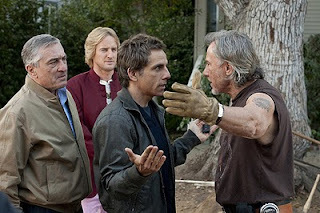 Plagued by health problems and Dr. Bob’s letdown, Jack turns to Greg Focker (Ben Stiller) as successor to the familial throne. As always, however, Jack lets his chronic paranoia get the best of him, particularly when Nurse Greg starts hanging out with a flirtatious drug rep (Jessica Alba) hawking a new erectile dysfunction pill. Reprising Kevin Rawley – the New Agey, obsessive ex-beau of Pam Focker – Owen Wilson enjoys his largest role in the series and repeatedly saves dead weight scenes. On the other hand, Dustin Hoffman and Barbra Streisand essentially give glorified cameos as Greg’s parents – indeed, Hoffman initially refused to appear in the film because of disagreements over script and replacing director Jay Roach with Paul Weitz (About a Boy). Otherwise, Little Fockers is the same exasperating collection of miscommunications and crippling family dysfunction, capped by a final tack-on scene shamelessly and sloppily designed to overhaul this mess into a holiday film – the ribbon and bow adorning the film’s ad poster is part of the same stupid masquerade. Each plot point circles back to Jack and Greg’s tiresome tete-à-tete, even though any modicum of basic human communication would defuse every conflict. There one moment of knowing hilarity when Jack calls into CIA headquarters to dust off his top-secret clearance. The incredulous phone operator tells Jack he can probably just find whatever he’s looking for using Google, an amusing nod to our open information age. Conversely, a scene in which De Niro and Harvey Keitel get into a shouting match only reminds you of the better films each of them once appeared in together. Chances are none of them featured De Niro pitching a tent in his pajamas.